We went up to my in-laws house on Lake Conroe last weekend to celebrate the completion of their remodeling project which included updating the kitchen and pool area. It was a great excuse to dig around in the back corners of my beer cellar for beers that would compliment the homemade paella my mother-in-law had decided to cook for dinner as well as for an afternoon and evening of lounging around the new poolside and hot-tub. It was a beautiful sunning afternoon and I started things easy by trying some of the new Hoptober from New Belgium, Modus Hoperandi from Ska Brewing and a few of my own American Mild. I was a little disappointed by the Hoptober. I know its only a golden ale, but something brewed with five different hops and the word "hop" in the name should be more, well, hoppy. The Modus Hoperandi, however, was excellent. A very well-balanced and easy drinking IPA. And, of course, I can't say enough good things about my own session beer. I'll admit, I did consult Garrett Oliver's The Brewmaster's Table to determine a beer for the paella. A lager or amber ale was the first thing that came to mind, but I wanted something a little more complex and unique. Garrett suggested a Belgian Strong Pale, but while moving bottles around, I spotted a 4 year old bottle of Midas Touch from Dogfish Head. Brewed with muscat grapes, honey and saffron, it turned out to be a great match. The saffron in the beer complimented the saffron in the paella and the sweetness from the grapes and honey worked well with the spiciness from the chorizo. It was also fairly light bodied which I was looking for since paellas can be pretty heavy. 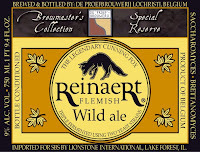 As we were finishing up dinner, I moved on to a bottle of Reinaert Flemish Wild Ale which I had originally thought might go well with the paella. It's a Belgian strong pale ale with some honey, fruit and spiciness (similar to the Midas Touch), but with a slightly sour finish instead of sweet. The initial flavours went well, but the sourness didn't compliment the spiciness. 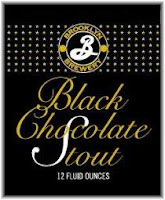 I hadn't specifically thought about dessert while picking out beer, but I had picked up a four-pack of Brooklyn's Black Chocolate Stout for my father-in-law to try who likes beer with a chocolate profile such as Independence's Bootlegger Brown and Young's Double Chocolate Stout. I don't think it was the best choice to have with a homemade key-lime pie, but they were both excellent. Following the Belgian theme I had started earlier, next up was a bottle of Hugh Malone from Allagash. Somehow I ended up with two bottles of this in the cellar without actually having tried it, so a cool evening on a patio seemed like an appropriate time to open one. The flavour was actually pretty mild for a Belgian IPA and not very complex. Flavours were sweet and almost tropical with a dry finish. The Belgian IPA style is pretty wide open to interpretation, I just wasn't overly impressed with this one. When we were done with dinner, dessert and a little relaxing, it was time to hit the hot-tub. The weather has been cooling around here lately with the evening lows getting into the 50's. I'd really prefer it to be snowing while sitting in a hot-tub, but we're in Southeast Texas and that's as cool as can be expected for this time of the year. I had specifically picked out a couple of strong beers that are suitable for slowly sipping as the evening winds down. When I stumbled across the Midas Touch, I had also found the rest of my stash of stronger Dogfish Head beers which included a few Immort Ale and Raison D'extra. At 11% and 18% ABV, these are certainly evening-enders. The Immort Ale had lots of dark fruit, vanilla and caramel malt flavours. Lightly carbonated with an almost creamy finish. Slight warming effect in the finish but not overwhelming. The Raison D'extra was similar, but with stronger raisin flavours as the name would suggest. Wonderful aromas of sweet malt and dried fruits. It clearly had benefited from the 5 years in my cellar as the high alcohol was certainly noticeable but not harsh or biting as I would expect it probably was when younger. Overall, it was a great weekend and I got to enjoy some of the fantastic beers that were hidden away and almost forgotten about. I ran across a few more beers that definitely need to be enjoyed soon, so hopefully I'll have a few more weekends like this one.